Home / Blog / YNPN Recommends: 3 Nonprofit Myths Debunked! This is a rather common misnomer that makes perfect sense. The name ?nonprofit? implies that the organization does not make a profit but in fact, that couldn?t be further from the truth. Many nonprofit organizations do make a profit and some happen to make millions and even billions of dollars in profit. The main difference between a nonprofit and a for-profit is how those profits are used. Any net income (profit) either through cash for services, sponsorships, donations, grants, etc., must be reinvested directly back into the organization to support its charitable mission. So in essence, the profits cannot benefit individuals of the organization, whereas in a regular company, profits can be used to pay bonuses, shareholder dividends, go directly to the owner, or any other way they deem fit. Key Takeaway: Nonprofits make money but pure profit is never their sole objective. 2. You can?t make any money working for nonprofits. Another common misperception is that you can?t make good money working for a nonprofit. If you were credulous about myth number 1, it is understandable as to why you would also believe this myth. After all, if a company doesn?t make profit, how can they afford to pay people? The truth is that many employees of nonprofits are compensated fairly and some even make six- and even seven-figure salaries. While this is not the norm, nonprofits are allowed to pay salaries that are determined fair and reasonable for the type of work they are performing. Employee wages are also dependent upon how strong (financially) the organization is. Key Takeaway: Many nonprofits do fairly compensate their employees. It all depends on how well the organization is funded. 3. Nonprofits are only for people who couldn?t make it in the business world. Contrary to what this myth implies, nonprofits are a part of the business world, although they may differ in their goals and outcomes from a for-profit business. It is rare that people decide to work in the nonprofit sector because they are having difficulty finding a job in the private sector. In fact, it is probably more accurate to say that people having difficulty finding a job in the nonprofit sector will work in the private sector. Good nonprofit jobs can be difficult to obtain since there are a limited number of organizations and you know that your work is not just benefiting the CEO or shareholders but instead meeting a community need. Many of the same skills and training required for the private sector apply to nonprofits — skills like marketing, sales, negotiations, public relations, advertising, management, accounting, computer programming, etc. The main difference being that often times these skills are applied to serve a charitable mission in the nonprofit sector that they are not meeting in the private sector. There are many private sector jobs that provide rewarding careers and are in companies that provide a value added product or service. Key takeaway: Nonprofits come in all shapes and sizes, from NPR to the NFL (yes, the NFL is technically a nonprofit) that offer great opportunities for those interested and should not be viewed as runner up to private sector employment. Looking for a career in the nonprofit sector? Check out the ConnectVA Job Finder ? the ?go-to place? for finding employment in the nonprofit sector! 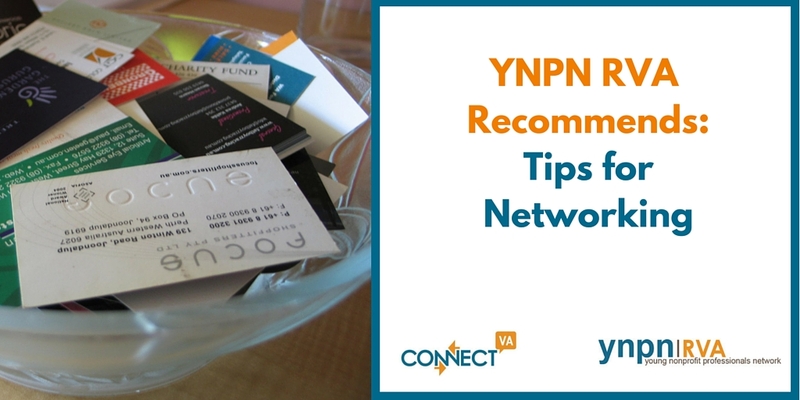 YNPN RVA, powered by ConnectVA, is a movement powering young and early-career nonprofit professionals through professional development, networking, and social opportunities to positively impact the Greater Richmond area.